inhibits dark staining production. Eye Envy is available in both the Original and Non-Refrigerated (NR) Versions, and is safe to use on kittens. This safe and reliable formula may also be applied to your pet to eliminate most feet and mouth/beard stains. Eye Envy is the ultimate in tear stain removal systems. Externally applied, this safe, non-irritating and effective cleanser removes unsightly stains and inhibits dark staining production. Note: When initially removing stains, it is strongly recommended to use BOTH Eye Envy Solution and powder. Together, you will receive the maximum results. Eye Envy is the ultimate in Beard and Tear Stain Removal Systems. Externally applied, this safe, non-irritating and effective cleanser removes unsightly stains and inhibits dark staining production. This safe and reliable formula may also be applied to your pet to eliminate most feet and mouth/beard stains. Safe to use on kittens. Step 1: The Eye Envy Tear Stain Solution for Dogs is the first of a 2- step system that will remove and eliminate tear stains. Externally applied, this safe non-irritating cleanser removers unsighly stians and inhibits dark staining production. Eye Envy is available in the Non-Refridgerated (NR) Verson and is safe to use on kittens and puppies. The Eye Envy Solution may also be applied to the feet and mouth/beard stains. NR Forumula does not need to be refrigerated. Eye Envy Solutions are natural and do not contain preservatives. Note: For Best results, use Step 2 - Application Powder when initially removing stains. Its is strongly recommended to use Both the Eye Envy Solution and Powder. 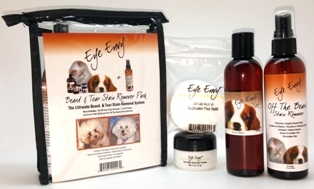 Eye Envy Off The Beard Stain Remover for Dogs and Cats will help eliminate beard stains and odor caused by saliva oxidation, artificial food/treat colouration, or yeast/bacterial infection. Off the Beard contains all Natural ingredients for a clean, smell-free and kissable beard. Step 3: Gently wipe around eye area. Don't be afraid to get it too wet. Do not pour solution into eyes, but don't worry if a little bit gets inside. Allow to dry. Step 4: Gently work the Eye Envy Powder into your dog's fur, working around the eyes and working powder against the hair growth. You can use a small brush or your fingertip. Allow to dry. You can apply the powder immediately after applying the solution. Avoid getting powder in their eyes or nose. You're DONE! Your dog's eyes should look great within a few hours. Continue this process for one straight week. After one week, apply as necessary. *Note: Step 1 is for the first time users and for animals that have extreme debris in their eyes. After the initial application, you will only need to do Steps 2 through 4. Far right photo of "Chantilly Lace" taken 1 hour after applying solution & powder.